It was well worth it to take the month of March off from goals. My plate was full and my brain needed a bit of a break. But now…I am looking ahead and excited to work towards improving my physical and emotional self! The only way I can describe this past weekend is NON-STOP! Saturday morning was the first day of spring yoga. I had 3 classes back to back. 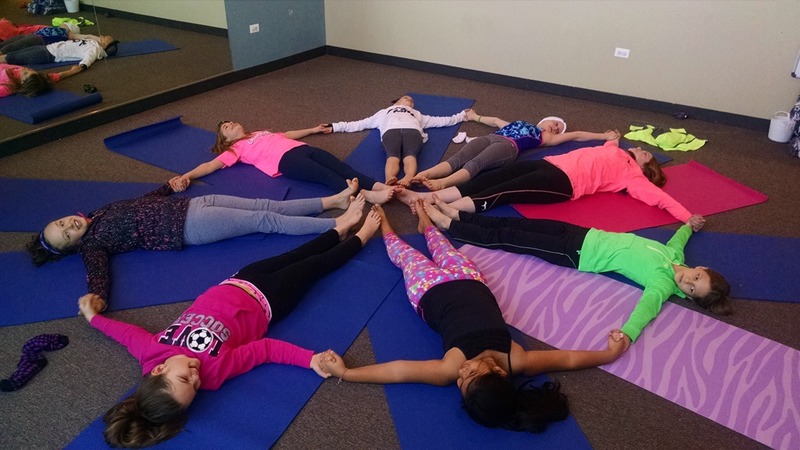 It was so much fun to be back doing yoga with the kids! We had some past participants and a few new kids. Overall, it is an extraordinary group, which makes my job easy and exciting. After yoga, I grabbed the BOY and I lunch at Jimmy John’s and had about 40 minutes to eat and change before going to the gym for a 3 hour self defense for runners seminar. I run, mostly by myself, so I thought it would be important to have a few techniques up my sleeve. I did learn some efficient ways to defend myself, but I also learned that I need to practice these skills. When the seminar ended, I raced out the door to go home for a shower. The BOY and I had #datenight plans with one of my friends and her husband. The 4 of us downed some fantastic sushi and had a wonderful evening of laughter and catching up. We had one more stop after dinner to swing by and wish Happy Birthday to the BOY’s sisters boyfriend before coming home and playing Mario Brothers on the Wii. The BOY was hungry (I have no idea how after all that sushi) and ordered pizza, which Cooper stalked like a pro. Who doesn’t love that Papa John’s garlic butter sauce? It reminds me of college! Sunday morning I slept in and started the day with a long cuddle with an adorable kitty. After that, it was off to brunch in the city, then downtown to check out bridesmaid dresses at BHLDN, and then post shopping tea with my mom, SIL, and a friend followed by a quick stop at Whole Foods on the way home. This morning, I met my trainer for a serious training session and then some friends for lunch and shopping. I picked up the CUTEST leggings at Lulu (on sale, of course)! After shopping, I stopped by the BRAND NEW Trader Joe’s in town. I am so excited to finally have one! Since I didn’t end up making everything as planned last week, I moved a few recipes to this week, including the Baked Teriyaki Chicken from The Recipe Critic. 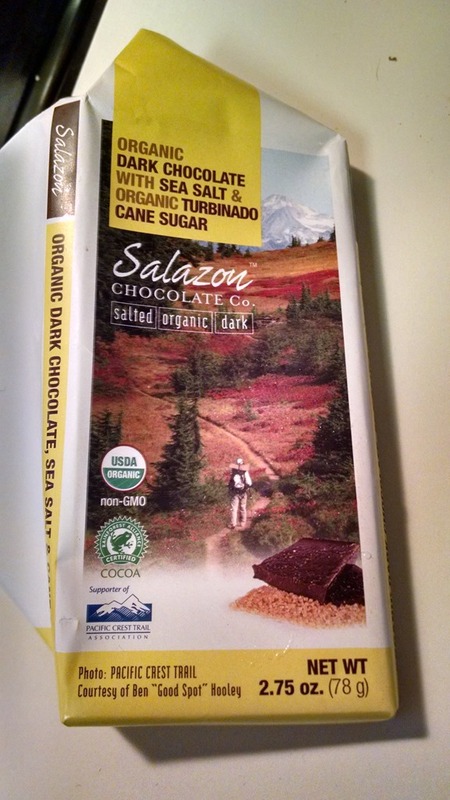 And followed by a new Whole Foods chocolate find. Like I said…it’s been non stop! But all good things and I know that more good things lie ahead! Did I mention we get to register this month?! I go through phases with my AM wake up call. Sometimes, I am a snooze monster staying in bed until the last possible minute. And then other times, I get myself into the groove of early bed times and early morning workouts. I struggle to get into the routine but once I am there, I feel good and I like it! Last week was transition week, and this week was GO week. Since I spent Sunday morning at the salt cave, I didn’t get in a workout. I was eager to get in some exercise Monday morning before my doctor’s appointment, and I’ve been craving a yoga class. Especially since kids yoga begins this upcoming weekend! I was already dressed and ready to go when I realized that the weather people were actually right, and we got some serious snow. It was still snowing on my sloppy drive to the yoga studio, but I was rewarded with a fabulous wall yoga class. 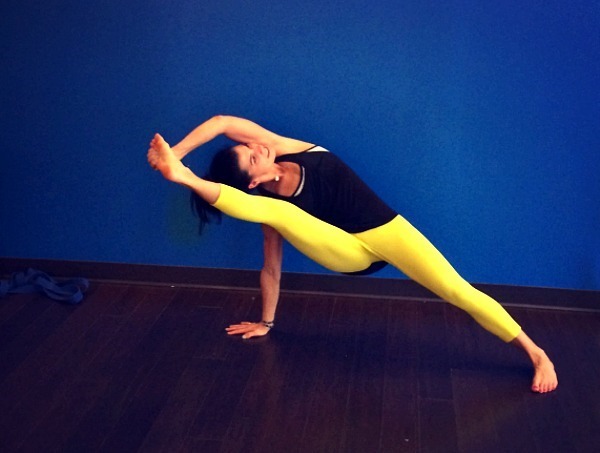 The most exciting part was attempting this variation of side plank with our bottom foot on the wall. I am not sure what I looked like (although I am confident it was not as graceful as this), but I LOVED the unique and awesome challenge! Wall yoga is always a special treat, and my muscles were shaking by the time I relaxed into ‘feet up the wall’ pose. Post yoga, I sipped on bubbly coconut water. They were sampling it at Costco this past weekend, and I am a sucker for samples. The rest of the morning was a snow filled mess! But the highlight was a lunch date with my BFF. Tuesday morning, I was reunited with the gym…specifically the indoor track. I have been holding onto my gym membership because it has an indoor pool and track, both of which are necessary for tri training, but really spending more time (and money) at the yoga studio. I told myself if I don’t go to the gym, I will have to give up my membership. So off I went for a short run (see below) and a few minutes of ab work. Wednesday it was back to the yoga studio. My schedule has changed a bit for the next two months. Because I am working Saturdays (aka teaching kids yoga), I get to go in later a few mornings (this means 9am instead of 7am). 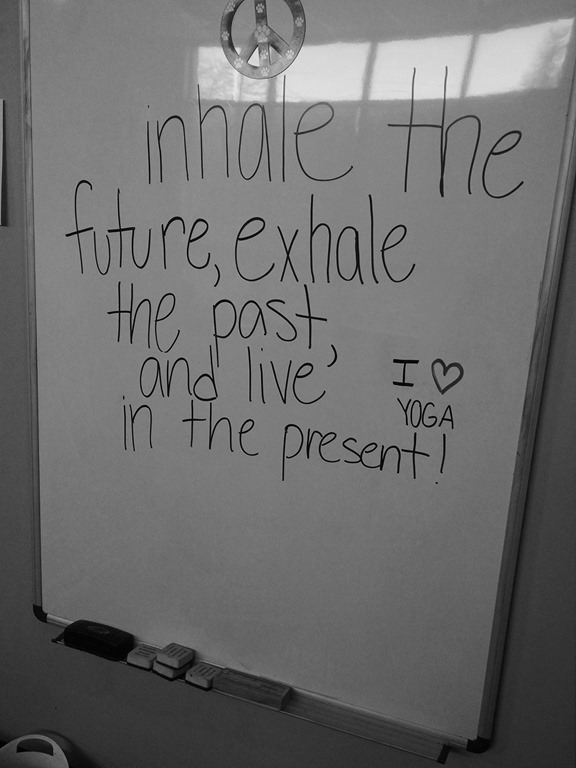 Which really means…Wednesday pre work hot yoga! 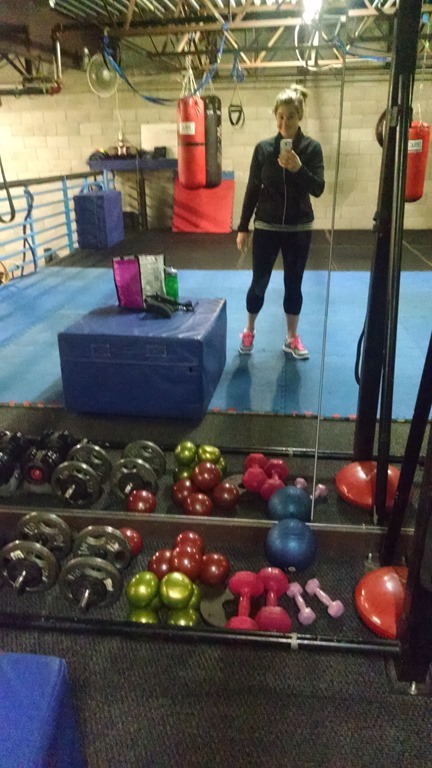 Then Thursday…it was back to the gym to try out one of their 6am strength classes. The truth is that I love the Tues/Thurs am strength class (and the people) at the yoga studio but if I am going to keep my gym membership, then I have to use it. I am always skeptical of park district classes, but was pleasantly surprised with the efficient and challenging class and the friendly instructor. With all of these super early workouts, you know I’ve been crashing in bed early…often with this guy! After this week, Friday morning is all about sleeping in. I tried to convince the BOY to go swim sit in the hot tub with me after work, but he wasn’t so interested. We both ended up working late tonight, so dinner was Portillo’s, wine, and basketball. We had a surprise guest. My future SIL stopped by and had a glass of wine with us which was fun! Yes…that is the mint chocolate cake shake in the picture below. If you haven’t tried it, I HIGHLY recommend it! We stayed up WAY to late watching basketball and although my abs are a bit sore when I move, laugh, or breathe, overall it was a GREAT week. I am not planning to maintain this schedule, but was happy to 1) get back into the routine of early morning wake ups and workouts. and 2) try out a few new classes. Both of which will help with tri training in the weeks to come! Are you a morning or afternoon exerciser? Tell me your thoughts on the chocolate cake shake! Everyone needs a little pampering now and again! Right?! This weekend I scheduled a post test spring facial on Saturday (plus tea with my mom). And then Sunday morning, I met two friends from work for brunch before we cashed in our Groupons at the Salt Spa. I’ve never been to a salt cave before, but I thought it would be fun to try. We got a tour of the spa which has some interesting saunas and float pods. Intrigued? You can read all about the benefits of sitting/floating in salt HERE. Then, we entered the salt cave for 45 minutes of quiet meditation. Luckily, we knew in advance that were going to have to be quiet, which is why we scheduled brunch beforehand. There are a few different types of salt in the room plus the salt you inhale through the air. The room is a bit chilly and as your blood pressure drops, your body gets cold. I laid back in my chair and cuddled up with a blanket. I didn’t know what to expect of the quiet room, so I took some deep yoga breathes and tried to relax. It was surprisingly easy and our 45 minutes flew by. Afterwards, we had tea and chatted about food, supplements, and exercise. I’m guessing that the spa is relatively new, and we were the only people there. The staff was friendly and it sounds like they have plans to make this an incredible and holistic wellness center. From Salty—>Sweet! Can you tell what I made today? After my girls morning out, I came home for lunch and grocery shopping with the BOY. It’s been a long time since I’ve ‘baked’ dessert. The BOY requested pumpkin pie with a crust from scratch. Ummm No! 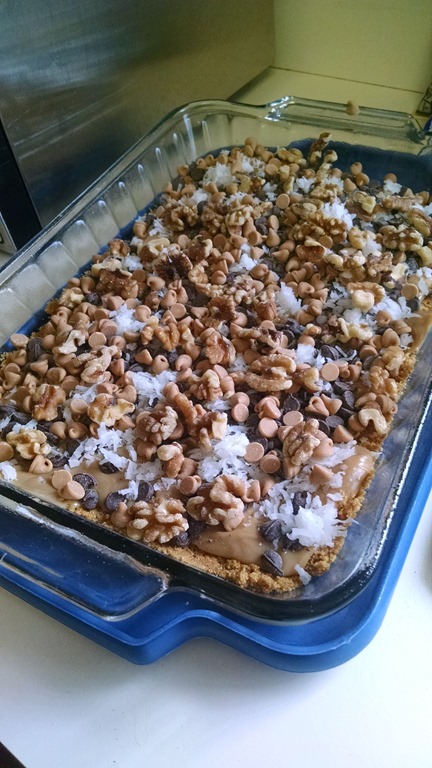 He settled for peanut butter magic cookie bars, which are similar to the original with a little PB mixed into the milk. My bars cooked while I did a little meal planning and spring cleaning around the house (while watching basketball of course). What’s interesting is that I am extremely thirsty and every time I breath through my nose, it feels like I spent my morning at the ocean. Except that it is super cold here (like we might get snow tonight), so it’s an odd feeling…a bit of a brain/body conundrum if you will. Have you been to a salt spa? Do you think you could do the floatation pod? Preheat oven to 350 degrees F. Spray a 9×13” glass baking dish with cooking spray. In a small bowl, combine the graham crackers and melted butter. Pour into the prepared baking dish and press down firmly. In the same bowl you used to mix the base, combine the sweetened condensed milk with the peanut butter. Pour evenly over the crust. Sprinkle the chocolate chips, peanut butter chips, coconut and chopped nuts over the milk/peanut butter layer. Bake at 350 degrees F for 30 minutes or until set. Remove from oven and cool completely. Drizzle with melted chocolate, if desired. Place in refrigerator for a couple of hours to chill to help with cutting. Once chilled, remove from refrigerator and cut into bars. Store in air tight container or freezer. 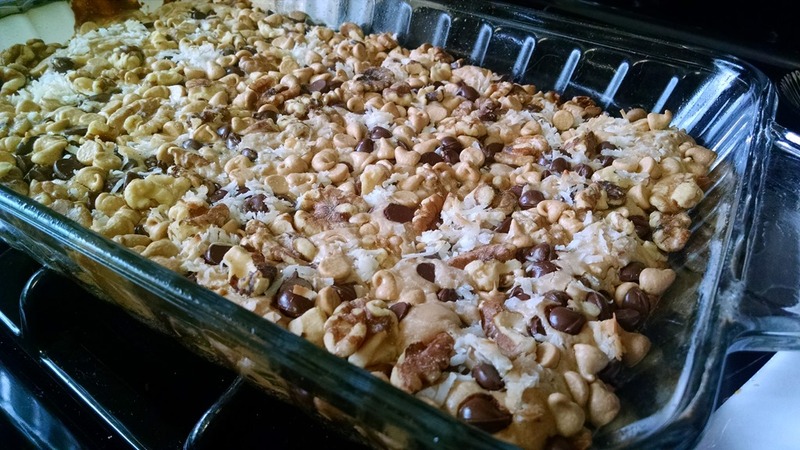 Not into peanut butter…the original Magic Cookie Bars are still and always will be amazing! Well kind of : ) End of May is my first race of the year…the annual Soldier Field 10 Miler. One of my favorite races because I usually run it just for fun, we finish in the awesome Bears stadium, and it is the kick of summer weekend! After that, I am hoping to get myself signed up for a summer triathlon. I was not able to do a tri last year, and so I came into this year with the thought that once the test was over, my next goals would be signing up for a tri and starting to train. My bike needs a little work before the ‘season’, but my running shoes are good to go. The weather is starting to warm and so Tuesday morning, I hit the path for a short 30 minute pre work run. It was windy, but I was thrilled to be outside running for the first time in…who knows how long! Then I was off to work in more green gear for St. Patty’s Day. I had plans to get in another good cardio workout Thursday morning. But, I stayed up WAY too late finishing off season 1 of the Blacklist to get up and workout. Should I be embarrassed to admit that?! If you watch the show, you would totally understand and not judge me : ) Thursday night was all about March Madness (as was Friday night + some wine). But, this morning I had a running date with my friend that was totally worth dragging myself out of bed for. What better way to celebrate spring?! We had much to catch up on and a triathlon to plan for! Confession: After my run I had a chunk of time before my facial, so I ate a snack in my car and listened to Serial. I know I’m the last to the Serial party, but I am diving right in. At noon, I had the most amazing facial with my favorite esthetician. My mom was scheduled after me again so the three of us had tea and cookies in between our appointments. When I got home, it was family nap time. On a totally different (and random) note, did you see Cooper’s look alike in the Lowes Glow in the Dark Cat Hat TV commercial? It makes me laugh every time. Is it possible that March Madness has better commercials than the Superbowl? We have an exciting Saturday night at home planned (most likely with more wine and basketball) and now that we have worked out some of the triathlon details, real training will begin REAL SOON! Are you watching March Madness? I started this morning with a fantastic 10 minute cuddle with Cooper after the BOY left for work. Cooper has been feeling a bit neglected lately! So have a lot of things…including our house : ) Before I met with my trainer, I did a bunch of cleaning, organizing, and laundry this morning. Then headed off to the gym. I warned my trainer that it’s been a long two weeks without exercise and some extra carbs, so it was good to get my muscles burning again. On the way home, I did a Costco and grocery store run. It was a HUGE success! It was the warmest day we’ve had all year! Oddly enough the BOY wanted chili for dinner tonight, which worked for me because I had just enough time to throw dinner in the crockpot, shower, and switch around laundry before I met my mom for an afternoon of shopping. That was also a HUGE success! I walked in the door moments before the BOY and we both dug right into the delicious chili! It was a gorgeous 70 degree day today and spring is in the air! Woo Hoo! What do you like to do when the weather gets warm? Do you eat chili in the spring/summer? In a large skillet over medium/high heat, add 1 Tbsp olive oil and sautee 1 lb ground turkey until cooked through. Add 1 medium finely diced onion along with 1 tsp cumin powder, ½ tsp chili powder, ½ tsp garlic powder, ½ tsp oregano, 1 tsp salt and ¼ tsp pepper (I added more seasoning). Saute until onions are softened and meat is lightly browned then transfer to a standard-sized crock pot, sprayed with cooking spray. Add drained black beans, pinto beans with juice, diced green peppers, and diced tomatoes. Add tomato sauce and stir to combine. Set on low for about 5 hours until piping hot. Taste and adjust for seasoning just before finished cooking. This past week’s motto was ‘Living on Dreams and Caffeine’ and it was one nutty week! But now that studying is behind me, it’s time to get Back to Life!!! That about sums up Saturday. Kids yoga starts back soon. I have a morning at the salt spa and a facial scheduled next weekend. You know how you go from never hearing about something to having 3 people talk about it in 2 days? That’s what happened with Serial. I just needed a little help learning how to download podcasts. Surprise! We had a wonderful belated party for my parents’ birthdays this morning. Need I say more?! There is much to do! Hooray for sunny skies and melting snow! Indiana with a 10 spot. Woo hoo! It will feel amazing to wake up tomorrow and get back to my ‘normal’ routine!